At Cole Plumbing, we understand that over time pipes can deteriorate and develop breakages either above ground or beneath the surface. When that happens, the entire plumbing system can be compromised and the lives of property owners can be thrown into chaos. A pipe break calls to mind unsightly digging, large bills, and a major disruption. But with the trenchless pipe lining that we offer in the Hope Hull area, it doesn’t have to be that way at all! Trenchless pipe lining lives up to its name as an ideal solution for pipe breaks without the mess and expense of digging up the line: no trenches necessary! Trenchless technology involves coating the interior surface of the broken pipe with a tough, time-tested epoxy resin. Using a single entry point, our technician is able to use specialized equipment to resurface the inside of the pipe either entirely or in certain sections. The practice of trenchless pipe lining has been perfected over the years, redefining the industry standard of quality and durability. Our work is backed by a customer satisfaction guarantee since the material used is dependable and our team’s application skills are proven to be reliable. And since the epoxy lining is thin, our Hope Hull customers can rest easy that the water flow through the plumbing system will not be hindered after a trenchless pipe lining procedure. What Makes Trenchless Pipe Lining Necessary? Trenchless pipe lining can be used whenever there is a break in the pipeline, whether inside or outside. Properties that were constructed in the 50’s and 60’s typically used metal piping, which has a tendency to deteriorate over time. The pipes weaken and fracture beneath the surface, sometimes letting in sediment or other organic matter which compromises the plumbing system as a whole. Even newer systems built with PVC piping are susceptible to damage, though. Unanticipated shifts and settling can lead to breaks in the piping or joints which require repair. Trenchless pipe lining is a great solution to strengthen and stabilize the plumbing systems for both clean water and waste water. Not every situation is right for trenchless pipe lining, but when it’s a viable solution, our technicians prefer to use this method since it requires less manpower, less material, and less time to perform. This adds up less stress and more savings for our customers! If a plumbing problem is suspected in a home or business, the first step is always a thorough inspection. Our team will come perform a camera inspection to determine the exact location of the pipe break and decide on the best course of action. If trenchless pipe lining is the best solution, our Cole Plumbing professionals will schedule that service quickly so that the fracture doesn’t have time to get any worse. Because our team is local to the Hope Hull area, our customers can be assured that timely service is a top priority for us. We consider all of our plumbing expertise, including trenchless pipe lining, to be a valuable service to our community as a whole. Give us a call if you have any questions about trenchless pipe lining or to schedule an appointment to evaluate your plumbing system. 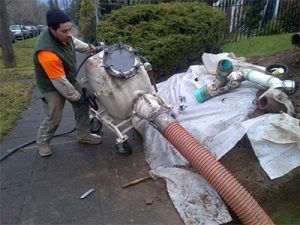 Is your sewer line damaged? Don’t call a fake plumber who will needlessly damage your lawn! Call Cole Plumbing, Inc. Today! We offer trenchless pipe lining to homes, businesses, and industries in Hoover, Alabama.